The cannon of Jewish recipes is an extensive one that spreads across many places and generations. Many of the recipes contained therein have been cooked by generations of women with only small changes in the way they have been prepared. Many of these recipes have come to be viewed as traditional dishes, prepared on holidays, Shabbat and other special occasions. They have come to play an important role at these times and are often specifically associated with these occasions. Due to the fact that these foods are not prepared on a daily basis, the occasions on which they are prepared become times to savor and enjoy them. Rosh Hashanah Symbolic Foods: How to cook them for you holiday meal discusses the symbolic foods eaten at Rosh Hashanah Seders held by some Sephardic and Mizrahi families. These symbolic foods include pomegranates, dates, string beans, beets, pumpkins, leeks, and fish heads. At the end of the article, the author invites readers to make dishes that are inspired by each of these symbolic foods to serve at their own Rosh Hashanah table, whether they choose to incorporate other elements of the Seder into their own celebrations or not. It is this last line of the article, which got me thinking about dishes that are not traditionally served during Rosh Hashanah but whose main ingredient consists of one of these symbolic foods. I like this idea because it provides one with the opportunity to create new food traditions while still including the traditional symbols that represent so much during the New Year celebrations. 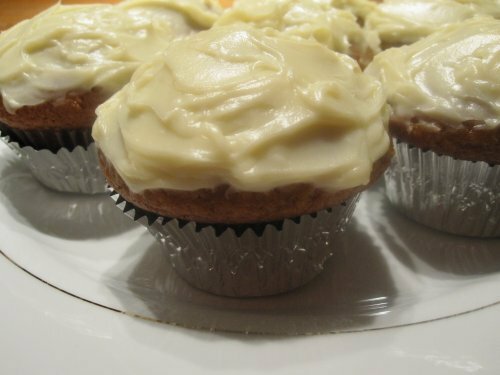 Among the delicious recipes suggested at the end of this article, it was the one for the pumpkin cupcakes that tempted me the most. On this holiday, pumpkins or gourds are meant to express the hope that just as a thick skin protects them, God will protect the Jewish community in the same way and gird it with strength. As explained in this article about Seders on Rosh Hashanah, before eating pumpkin the following blessing is recited: “May it be Your will, God, to tear away all evil decrees against us, as our merits are proclaimed before you.” This blessing plays on the word K’ra, the Hebrew word for pumpkin or gourd, which resembles the words for tear and proclaimed.